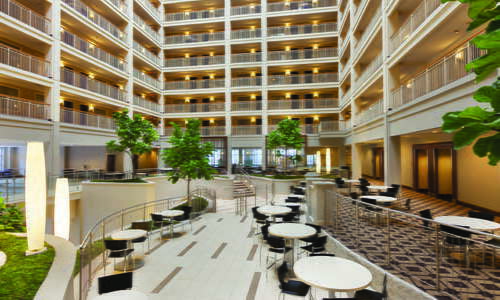 Rooms are arranged around an 11-story, plant-filled atrium lobby where bubbling fountains keep noise levels relatively high. Making efficient use of space, all suites have separate living rooms with a pullout sofa, four-person dining table, and extra TV. The last renovation was in 2013. 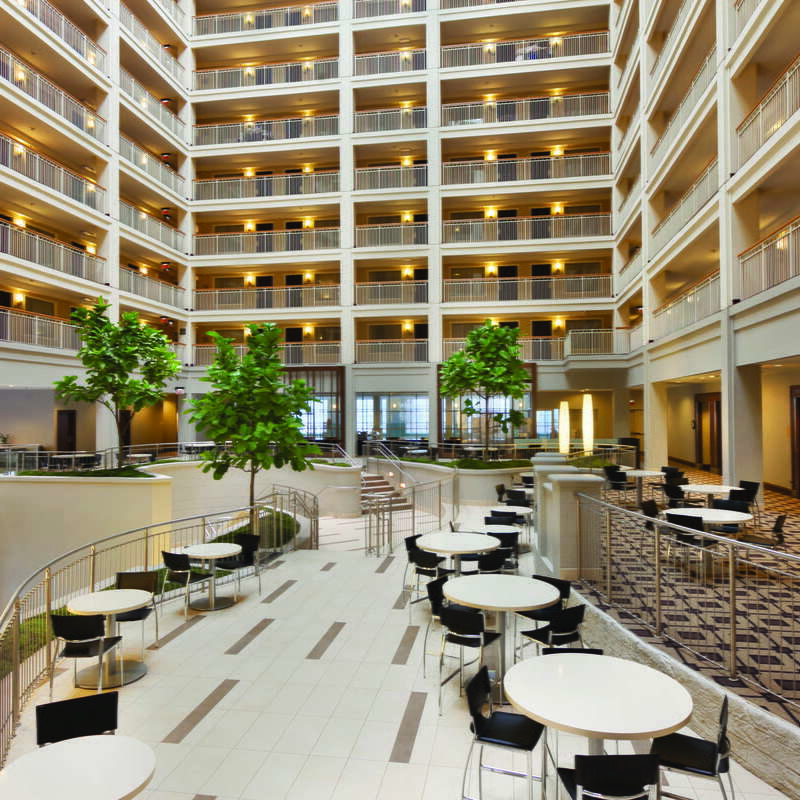 A 24-hour business center, plus a complimentary full (hot) breakfast each morning and cocktails each evening are especially appealing to business travelers. 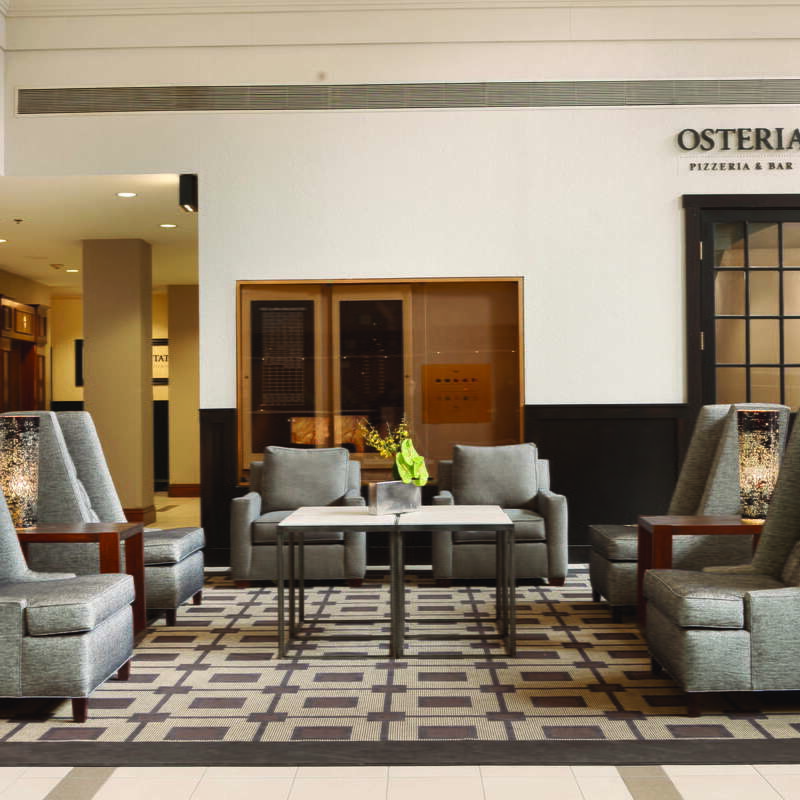 The indoor pool and fitness center are added perks, as is the renowned on-site restaurant, Osteria Via Stato. YOU SHOULD KNOW WiFi is not free at this property and requires an additional charge. Easily dividable, each of the Suite category rooms features a living area and a sleeping area, with a pullout sofa in the living area to further spread out if traveling in a group or with small children. In the non-suite rooms, you'll find a King bed. A coffeemaker, microwave and refrigerator are also in each room, regardless of the room category. YOU SHOULD KNOW Pets are not permitted to stay at this property, even with an extra fee or deposit. Baths are decked out in your typical hues (neutrals) with modern accents that include a chocolate-y brown granite vanity countertop and a mod black-and-white art print hung on the wall. The lobby's high ceilings bring in natural light and create an inspiring, yet cozy, space no matter what time of day or night. Staff stand behind desks off to one side, eager to handle guests' check-in and check-out process, as well as answer questions about local transportation and attractions. An indoor pool at this property is a huge perk for guests to use during their stay. The poolside vibe is strong, with cushioned chaises on one side of the pool, perfect for relaxing with a good book or watching the kids swim. The fitness center is stocked with state-of-the-art equipment. 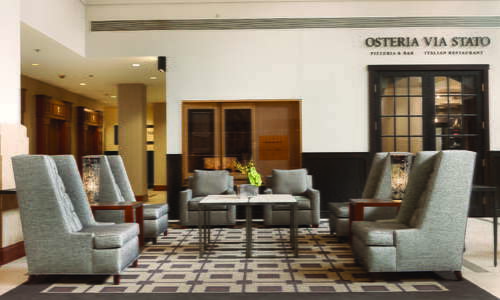 Osteria Via Stato is open all day long, starting with the free complimentary hot breakfast for all guests, then easing into a fixed-price offering for lunch and dinner that consists of three courses (guests choose selections for each course). As the name suggests, fare trends toward Italian. A more casual option is Pizzeria Via Stato, serving wine by the glass as well as pizzas. It's open for lunch and dinner service. This hotel's restaurant is delicious and a true destination so make sure you push aside any notions you might have about a restaurant tucked into an Embassy Suites by Hilton property. The hotel is one block from the free trolley to Navy Pier (otherwise it's a quick 21-minute walk on a nice day). You don't need a car while staying at this property thanks to its location near museums, theaters and cultural attractions in the Loop, Magnificent Mile and River North neighborhoods (and can avoid the hotel's $59 nightly parking fee). To take public transit south to the Loop, either hop on the Red Line at Grand and State or take the 3, 147 or 151 buses. Uber and Lyft drivers are always in the area. The 36 bus (catch it at State and Ontario) will get you to Lincoln Park Zoo, north of the hotel. Beatrix (5-minute walk) is a great spot for a casual lunch, with many gluten-free and vegetarian items on the menu. For a veritable tour of Italy, visit Eataly (2-minute walk), a two-story building filled with edible Italian delights, including gelato, wine, groceries, a bakery, coffee bar and several restaurants. A block south of the hotel, Rock Bottom Brewery (2-minute walk) satisfies discriminating beer-drinkers' palates. Despite its name, Hubbard Inn (8-minute walk) does not offer overnight lodging--instead, craft cocktails and beers are served in an intimate setting. 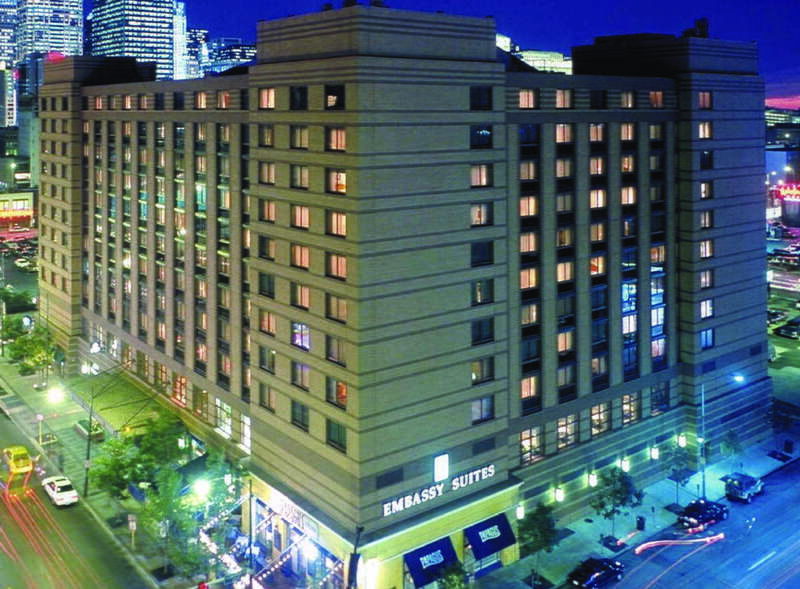 Suite-sized accommodations at this rate are hard to come by in downtown Chicago and you can't beat the location, whether you're in town to see a blockbuster show at a museum or take in a play at one of Chicago's famed theaters. The lakefront, including Navy Pier and Lincoln Park Zoo, are within a half-hour walk or 10-minute ride. 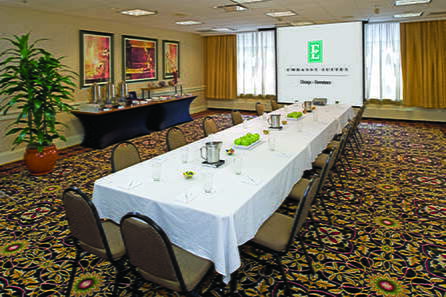 That all rates include a free hot breakfast is another reason to stay here.